Last Friday I had the opportunity to watch my sister’s girls since they didn’t have school. A flexible schedule is definitely one of the things I love about working from home. My sister dropped off the girls very early in the morning so they understandably hadn’t had breakfast yet, but they were very hungry. I usually try to involve them in making meals (and/or setting the table) whenever I watch them, but this time, I thought I’d have Katelyn (the elder of the two) make breakfast all by herself. I told her what to do and how to do it and I made sure not to take over and not to do it for her. She made some really tasty Spinach and Jalapeño Havarti Omelets and I was surprised at how good they turned out. Since breakfast was such a success, and since Katelyn was uncharacteristically eager to assist with cooking, I thought to take advantage of her newfound enthusiasm and have her make lunch too. Of course, I thought of something really easy that she’d be able to handle on her own – she actually made this from start to finish (even plated it) with no assistance. The only assistance I provided was through instruction and very minimal demonstration, if any. 1.) Open can of tomatoes and separate half of the can into a container. 2.) Remove stems from parsley and wash it. Chop finely. 3.) Peel garlic, remove ends and mash garlic completely. 4.) Heat a small saucepan. 5.) Put 2-3 tablespoons of olive oil in the saucepan and heat the oil. 6.) Add mashed garlic and fry until just before it turns brown. 7.) Add canned tomatoes quickly. 8.) Add salt, pepper, sugar, oregano and basil. 9.) Taste it to make sure that it tastes good. If not, add more of whatever it needs. 10.) Let sauce simmer on low heat. 11.) Boil about 4 liters of water in a large pot. 12.) Once water is boiling, add 2-3 tablespoons of olive oil and 4 tablespoons of salt. 13.) Add fettuccine and boil. 14.) Mix right away and make sure they don’t stick to each other, nor to the pan. 15.) Throw one piece of fettuccine on the fridge – it’s ready when it sticks. 16.) Strain fettuccine in a large colander in the sink. Rinse with cold water. 17.) Rinse the pot then heat it to boil all the water away; add remaining oil to pan. 18.) Heat the fettuccine until it’s covered in oil and doesn’t stick; mix in the sauce. 19.) Put the fettuccine in a plate (a little bit at a time). 20.) Sprinkle with cheese and then with parsley. Eat! Normally I prefer the taste of chopped garlic over mashed garlic, (yes, there is a big difference), but Katelyn was afraid to use the knife so I had her mash it using a mortar and pestle instead. Also, if you have fresh basil on hand, it’s much better than dry basil. What I usually do is toss in a couple whole basil leaves in the tomato "sauce" and simmer, (they’ll turn black with the heat so leave them whole), and then remove them before serving. You can then garnish the top with fresh chopped basil instead of parsley, or even use both. 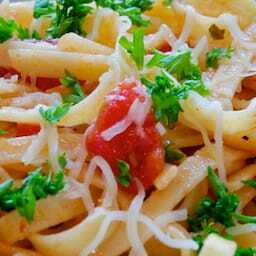 Katelyn’s Tomato Fettuccine was published on Wednesday, September 23, 2009 at 11:32pm MDT by Daniel Menjívar and last updated on April 11, 2018 at 9:30pm UTC .